How much fun are they? Not telemarketer questionnaires, junior high questionnaires. When I was in eighth grade, my friends and I would stay up all hours of the night on the weekends, talking on the phone, creating a series of questions to ask each other when Monday rolled around. We'd exchange papers and diligently filled them out under our textbooks during class, comparing answers later at recess or free period. My cousin recently sent me one for giggles and we had a good laugh about it. 1. What time did you get up this morning? 5:58am. 2. Have you ever been in love? Of course. Hello? OREOS? 3. What was the last film you saw at the cinema? Paddington with my littles. With one of my littles. Okay, FINE. I went on my own. You got me. 4. What is your favourite TV show? I don't have a favourite per se as I don't watch much television, but I love The Office and 2 Broke Girls. I also enjoy Outlander and The Mindy Project - Mindy Kaling is hilarious. I like Orange Is The New Black and reruns of Friends when nothing else is on. Mad Men was really good and so is Downton Abbey. Call The Midwife is amazing too. Big Bang Theory and Modern Family is up there for a good laugh. But my favourite? Again, I don't have one as I don't watch much television. 5. Are you wearing socks right now? I sure am. My socks wear socks. I own more socks than most people should. MY SOCKS OWN ME. 6. What is your middle name? Princess Consuela Bananahammock. 7. Favourite Actress? J'adore Sandra Bullock and Anna Kendrick. 9. Favorite sandwich? I love grilled vegetable with goat cheese panini, but I also love a good Philly Cheesesteak and sometimes when the moon hits the earth just right and the fairies dance around the virgin fire, I love a salami and cheese with Caplansky's mustard on soft, white bread. 10. Favourite item of clothing? Tank tops and pajama bottoms. And my gold lamé bodysuit. 11. If you could go anywhere in the world on vacation, where would you go? Barcelona. One day I'll get there. 12. How many siblings do you have? Two. I'm the favourite though. Obviously. 14. What was your most memorable birthday? My seventh. I kissed Bryan Fowler on my parent's front porch swing. He told me he loved me, then we played freeze tag. 15. Favorite sport to watch? My neighbour chase his dog into his car every morning. 16. Are you a morning person or a night person? Probably night, but I can rock 2:30pm like nobody can. 17. Pets? Two cats, Chloe and Sophie. Little terrors. 18. What did you want to be when you were little? To be awesome. Nailed it. 19. Favorite candy? Candy Sommers. She's gives out KitKats and Reese's Peanut Butter Cups to the neighbourhood kids every Friday. 20. What is your favorite flower? All-purpose. 23. What was your favourite toy as a child? My Cabbage Patch Doll. Until My brother ripped her head off and my Mom duct taped it back on and called it a scarf. Good times. 24. Coffee or Tea? I enjoy coffee, but I can drink tea all day long. And I like it the way I like my men - strong and very sweet. 25. What was the last thing you ate today? THESE SCONES. Friends, these are the key to world peace if I do say so myself. And they are so MAGICAL with THIS GORGEOUS SAUCE all over them. *For a more British-style scone, omit the egg. It will produce a crumblier texture. Preheat oven to 400 degrees F. Line a baking sheet with parchment paper or a silicone mat. In a mixing bowl, whisk together flour, sugar, baking powder, and salt. Using a cheese grater, grate butter and massage into flour mixture until it resembles coarse crumbs. Grating butter is a great way to ensure mixture stays cold, but allows you to work fast. In a small bowl, whisk yogurt, egg, and vanilla seeds together until smooth. Using a fork, incorporate yogurt mixture into flour mixture until dough begins to come together and is moistened. Turn dough out and pat into a 6-inch circle and about 3/4 inches thick. Using a bench scraper or large knife, cut dough into 8 wedges. Place on prepared baking sheet about an inch apart. 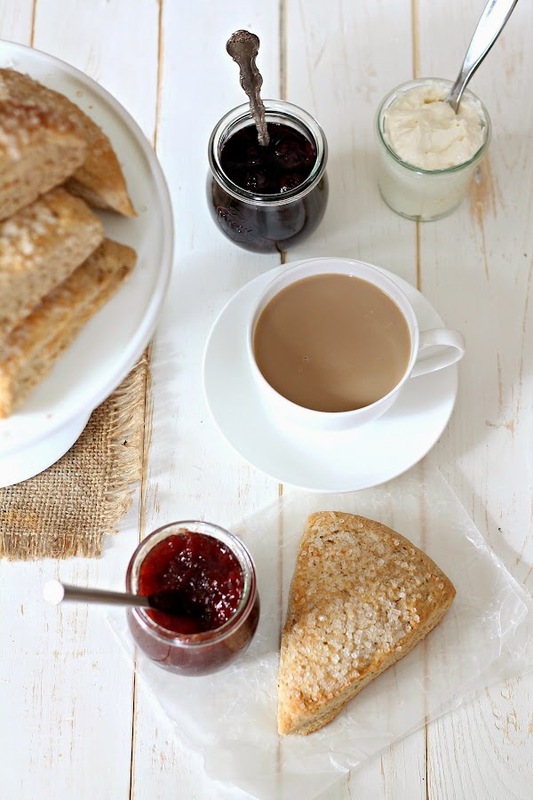 Brush the tops of scones with milk and sprinkle with sanding sugar. Bake for 15-17 minutes or until scones are a golden brown. Remove from oven and allow to cool for several minutes before transferring to a wire rack. 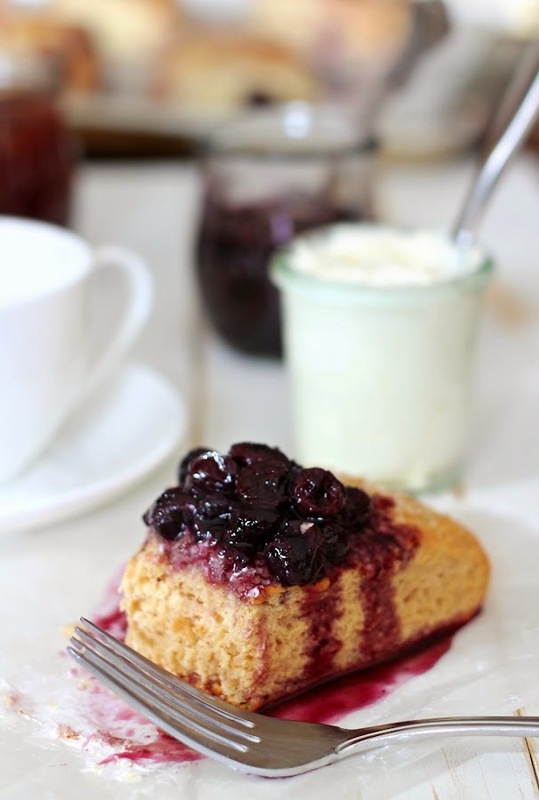 Serve warm with clotted cream, jam, or Christina's Maple Blueberry Preserves. Scones will keep nicely for 3 days in an airtight container. 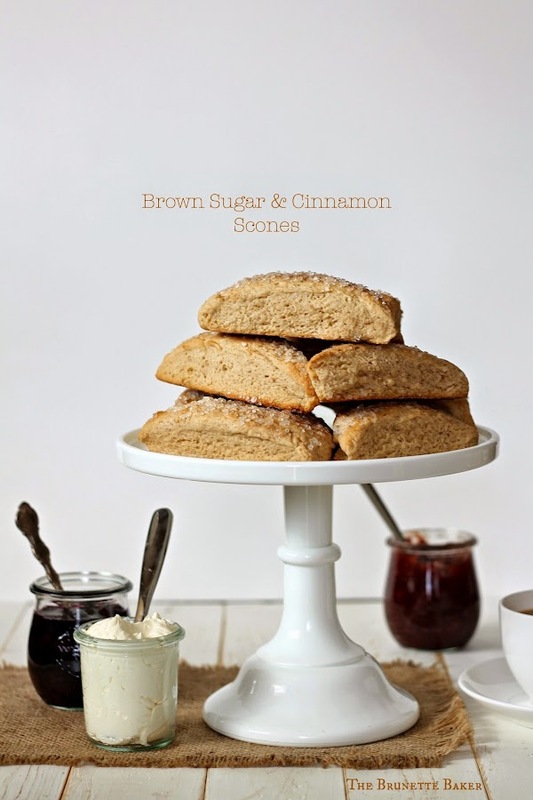 and I love these scones-brown sugar and cinnamon are oh so perfect for breakfast time sweetness!